With almost 13,000 participants and 200,000 spectators, the Deutsche Post Marathon Bonn is one of the ten largest running events in Germany. In 2019 he will be on 07. April take place. 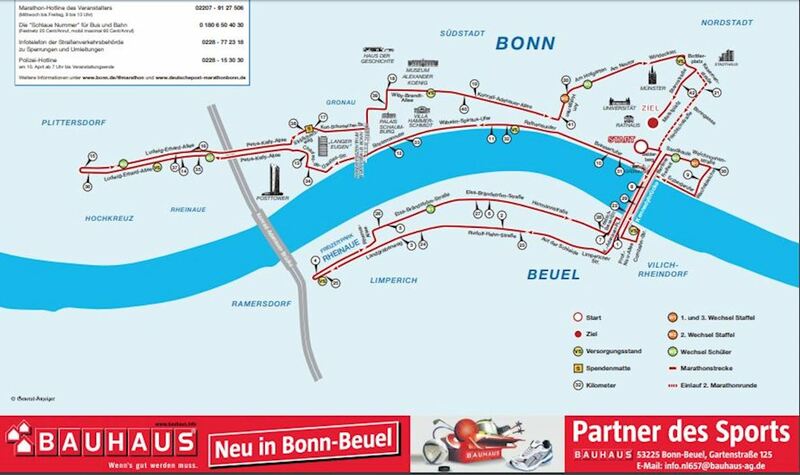 The run leads the athletes through the federal city of Bonn, along the Rhine and past many sights and landmarks of the city. Marathon and half marathon runners, walkers, inliners and hand bikers will be there. Even as a team you can go to the start of the marathon season or the Bonn company run. Students start at the BAUHAUS school marathon. There are 6 refreshment points on the route. Drinks and solid food are served at all the food stations. Since the marathon course goes over two laps, there are 12 meals and an additional 2 water points in the course of the marathon race. Timing is done by ChampionChip. For all participants, who have not specified a ChampionChip number when registering, a rental chip is provided. It is not an interesting half marathon. The route is a very boring. The finish line is very tight. The marathon is two laps. It is not an interesting half marathon. The route is a very boring. The finish line is very tight. The marathon is two laps. In front of Koblenzer Tor. The marathon course (two laps) for runners is officially measured by the DLV (42.195 km), level, paved and free of traffic. The route presents the federal city of Bonn from its most beautiful side: museums, churches and the Rhine lie along the route.